While the English language frequently refers to what our bodies know — “gut feelings,” hearts “reaching out” to others, etc. — many of us have learned to ignore, deny, or even mistrust our body’s inherent wisdom. Even worse, a lot of people don’t like their bodies very much at all. As a result, we often cut ourselves off from one of our greatest allies. 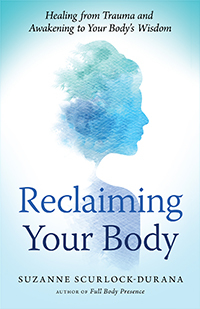 In Reclaiming Your Body: Healing from Trauma and Awakening to Your Body’s Wisdom, author Suzanne Scurlock-Durana provides the tools and guidance necessary to reconnect with our body’s inner guidance system of sensation, imagery, and inner knowing. Her book includes chapters for each main “wisdom area” of the body — the heart, gut, pelvis, legs and feet, bones, and brain — and explores each area’s unique roles in the process of developing full-body presence. We hope you’ll enjoy this short excerpt, which speaks to the wisdom of the heart. The heart is the wellspring of our inspiration for life. The characteristic wisdom of the heart is in how it inspires us to live more deeply and fully and to create from our gifts. The energy of love resides throughout the entire body. It is the foundational energy upon which our creative inspirations are born. Although the energy field of the heart has been proven to be quite powerful, in our culture today the voice of the heart is often muted or ignored altogether. When our heart’s intelligence isn’t activated, we can easily feel confused, or we may listen only to the voice of the head telling us what we should do. The inspiration of our deepest heart’s knowing is then lost to us. There is a distinct feeling when we drop into our heart and let it open up. When we share from our heart, there is an authenticity and vulnerability that create a feeling of connection and intimacy if the listener is open and receptive. There is also a distinct feeling when we are not connected to our heart. This could manifest as “coldheartedness,” which might be experienced as a chill in the room or a conversation killer, and it will create a block to genuine intimacy. Another feeling occurs when we are in our heart in an overly sympathetic manner. These kinds of interchanges often feel cloying, sometimes suffocating, and frequently invasive. Yet another experience occurs when our heart resonates with another person’s heart. A warmth in meeting, ease of connection, feeling deeply seen and heard — these are the empathetic connections that may become lifelong relationships or enduring imprints on our heart. What is the quality of energy that our hearts generate? The heart expresses warmth, compassion, forgiveness, empathy, loving-kindness, and most of all inspiration. A full-hearted person is a happy person. In Chinese medicine, the element of the heart is fire, and there is a distinct sensation when this element is balanced. We feel excited, creative, and “on fire” for life. The heart is the birthplace of our deepest inspirations, so when it has been suppressed or exhausted, we may have a flat, muted experience. Burnout approaches when our creative fire has gone out. The heart is the home of compassion. When I work with someone in the helping professions, especially healthcare providers, their genuine concern for others is apparent. Their warmth and caring is frequently the original inspiration that moved them toward their profession. However, when I sit with them long enough, I often discover that they are much better at giving than receiving. The front of a caregiver’s heart — the part that they radiate love from — feels warm and wide open. However, often they have much less awareness of the back of their heart, the heart space of self-love and nurturing. I think of this as the deep well that feeds the rest of the heart. Like any well, when it is not primed and replenished, it runs dry and burnout starts to take hold. The front of the heart — the part shared with the world — needs connection to the deeper well of the heart in order to survive and thrive. This means self-care is mandatory, not optional. The airlines truly do have it right. You must “put your own oxygen mask on first” before helping those in need around you. What the flight attendant doesn’t say is that if you fail to care for yourself first, unconsciousness or even death may result. Yet many of us have been taught to ignore our own needs as we focus on caring for those around us. This is a sure recipe for disaster. Now is the time to turn this paradigm around and treat our own heart as a primary resource that is to be treasured and deeply valued. The heart is the home of our deepest inspiration and the well of our love for life. Having respect for the wisdom of the heart and living from its rich depths is essential. Suzanne Scurlock-Durana is the author of Reclaiming Your Body and Full Body Presence. Her Healing from the Core curriculum combined with CranioSacral therapy and other bodywork modalities creates a complete, body-centered guide to awareness, healing, and joy. She teaches around the world and lives in Reston, Virginia. Visit her online at www.HealingFromTheCore.com. Excerpted from the book Reclaiming Your Body. Copyright © 2017 by Suzanne Scurlock-Durana.